As a certification association for cat groomers, the National Cat Groomers Institute set the standards for cat grooming within the pet grooming industry. Certification drives groomers to provide the highest level of care and service and also assures clients that their beloved pets are in good hands. While certification is certainly not the only measure of a groomer’s abilities, it has been linked with higher earning potential and other rewards. In order to show one’s aptitude for performing the handling and grooming skills necessary in meeting those standards, the NCGI. offers two different certification titles. The majority of our Certified Feline Master Groomers have completed our training program either through the 2-week cat grooming schools (see list below) or through our distance learning program – the Complete Cat Groomer Training Syllabus. The Syllabus is the most in-depth cat grooming training available that includes 2 books, 5 DVDs, 12 online courses and a private Facebook group for students. NCGI instructors also provide you with a 10-week program that guides you through all of the provided materials, how to take the certification exams and is available to support you throughout the program. After going through the Syllabus materials, we recommend seeking out hands-on instruction with one of the NCGI’s Approved Trainers or Certifiers to help bring all the lectures, video demonstrations, step-by-step tutorials, etc. from the Syllabus together in practice. Our Trainers and Certifiers provide 1-on-1 instruction to help prepare you for your practical exams. Earning the Certified Feline Master Groomer™ (CFMG™) title requires passing a total of nine exams with a grade of 85% or higher. The nine exams consist of four Written Exams and five Practical exams. NCGI Membership is required for certification. All Written Exams can be administered via proctor (i.e. a teacher, librarian or grooming school instructor) or by an NCGI Certifier or Trainer. All Practical Exams MUST be administered in-person by an NCGI Certifier or Instructor. Written exams are sometimes administered at grooming trade shows and NCGI workshops, contact the NCGI office for schedule availability. Cost for each (written or practical) exam is $65.00. Cost for all nine CFMG™ exams is $585.00. Cost for one CFCG™ practical exam is $65.00. In preparation for the four Written Exams, a student must purchase and study the Written Exam Certification Prep. This is also included in the Complete Cat Groomer Training Syllabus. In preparation for the five CFMG Practical Exams, students have the option to study and practice on their own. There are no requirements for purchasing study materials or attending any training. There are, however, standards that must be met in order to pass the Practical Exams. It is up to each student to determine what training would best equip them to meet and exceed those standards. To assist students in meeting and exceeding the practical grooming standards, the NCGI offers instructional book, DVDs and online courses, as well as lectures and demonstrations at various grooming industry trade shows and workshops. The NCGI also offers the Complete Cat Groomer Training Syllabus that provides a 10-week long guided course designed to teach the skills and knowledge necessary for safe, efficient, quality cat grooming. The NCGI also has a number of Certifiers and Approved Trainers in locations around the globe who can provide hands-on instruction and practical exam administration (*Certifiers only). See the full list here. There are also three hands-on cat grooming schools that were based on the NCGI’s original cat grooming school and incorporate both our training materials and provide the opportunity to take both written and practical exams towards CFMG certification. 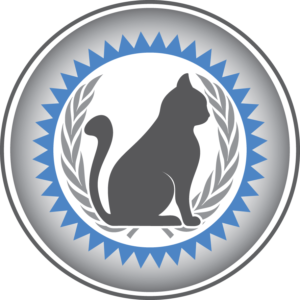 NCGI is an international organization for cat groomers. We are working on expanding testing to include additional languages beyond English. Many of our Certifiers and/or Trainers are multi-lingual as well. Contact the NCGI office if you need a particular language instructor and/or written exam. The NCGI also offers the Certified Feline Creative Groomer™ (CFCG™) title to those wishing to learn the art of creative cat grooming which applies both color and creative design. In order to obtain CFCG™ certification, a groomer must first earn their CFMG™ certification and then pass one Creative Grooming Practical Exam with an 85% grade or higher. The CFCG practical can be administered during a creative competition or runway (at a trade show NCGI is attending), during a creative workshop or private instruction with a CFCG Certifier.